The Irish Music Night at The Cooper’s Irish Pub, in Nagoya. I did a pub shoot last night. It was a fun challenge. It was an Irish music night, and it was fantastic, and we were lucky to have a great Irish dancer do a great performance too. I had to work in very low light and in a small tight space. I did my best to get the standard-clean shot, and some interesting creative photos too. I’m also really lucky to be able to go in and do a shoot with my studio lights. During the typhoon, I’ll be working on photos from today’s pub shoot. Any work/background music recommendations? Each year on the 3rd March is Girls Day in Japan. In Japanese it’s called Hina Matsuri, which means Dolls Festival. Usually, families set up a large display in late February, like the one below, and have their daughters pose next to it for photos. The dolls are based on the Heian court, and are arranged in descending order of rank across either a five or seven tiers. 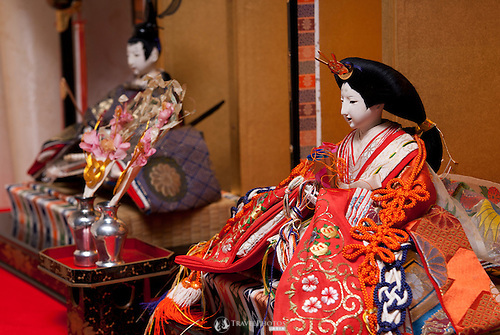 Each tier and doll has a specific meaning, but generally it was or is believed that the dolls take away evil spirits. The display is usually set up in the tatami room or guest room of the house. There are special foods and drinks that girls have on the day. Some communities might host some events just for girls, but other than that, not much else happens, however, the Nagoya Womens’ Marathon is next weekend. Also see the Japan Today Girls Day story, and Wikipedia/hinamatsuri. For this photo, and others like it, see the Girls Day gallery. For a few weeks now I’ve been doing a “Photo of the week” on my Twitter feed. I’m choosing the nice photos of something relevant now or soon, or just personal favourites that need a gentle nudge into the spot light. However, I have got concerned that I might repeat a couple of photos accidentally, perhaps to the annoyance of followers who are eager to see what’s coming out of the land of the rising sun, so this begins my ad hoc cataloguing attempt. Seriously, there are people who do look forward to seeing what’s new from me. I’m not surprised, I do look forward to my daily Dilbert and Sinfest comics. This Photo Of The Week (POTW) is being promoted now, six months in advance, so that editors can organise their material and choose my photo for it. As you can see, it’s a stunner. And as you can see, it’s a public event and children were there. Here is my blog entry about the Tagata Fertility Festival, held annually in March in Nagoya, Japan. Here is a list of previous POTW.